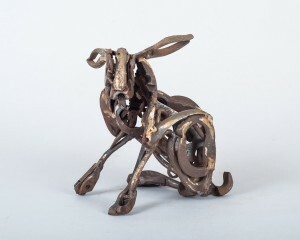 The annual exhibition is held at the Mall Galleries London from 25th October to 4th November. 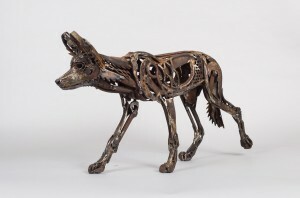 I will have eight pieces on show there but it is well worth a visit if you are keen on all kinds of art inspired by the natural world as there are over 350 catalogued works by numerous artists in addition to unframed project work in the Out of the Frame room which includes work by the amazing Ben Woodhams SWLA. 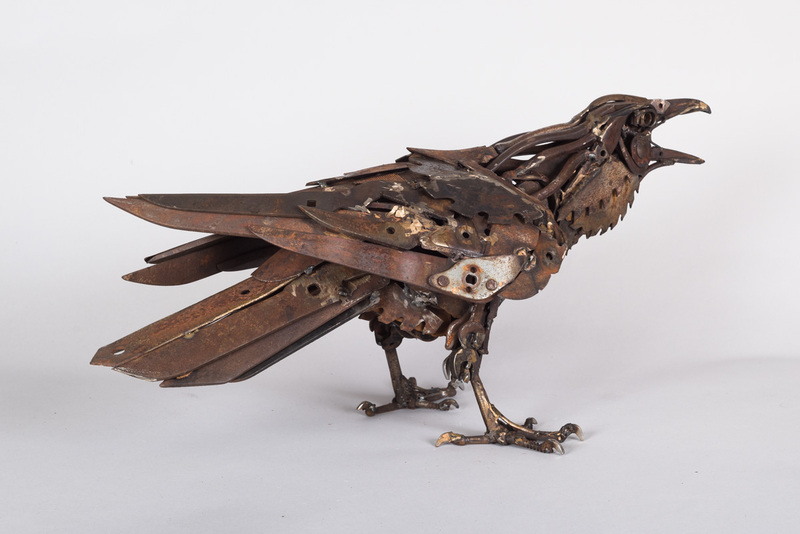 Sawblade Raven is about life sized and involved a lot of shears for the wings and tail feathers. The bill began as a ‘finger’ from a combine harvester, the point through which the recipricol blades slide back and forth to cut through the crop. 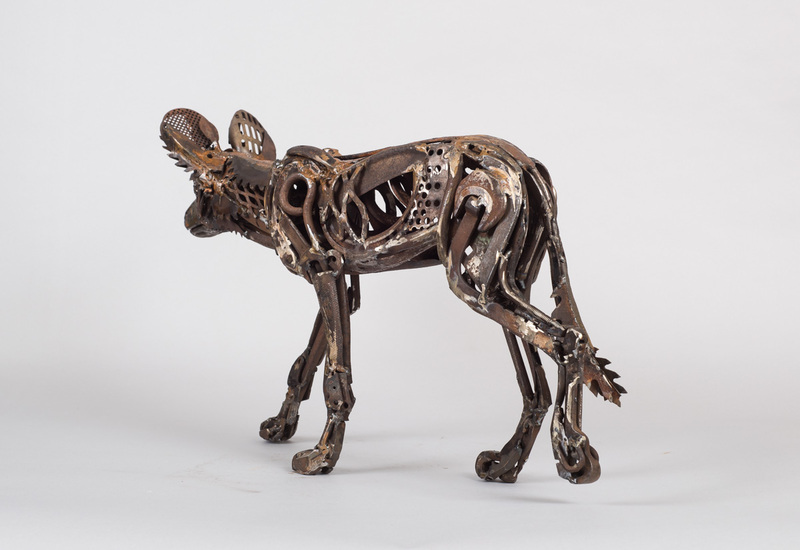 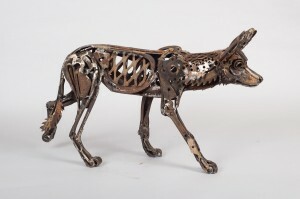 Spoon Wild Dog was inspired by a trip to Kwazulu Natal several years ago I was lucky enough to see a small pack of dogs and made many rapid sketches before they disappeared into the bush. 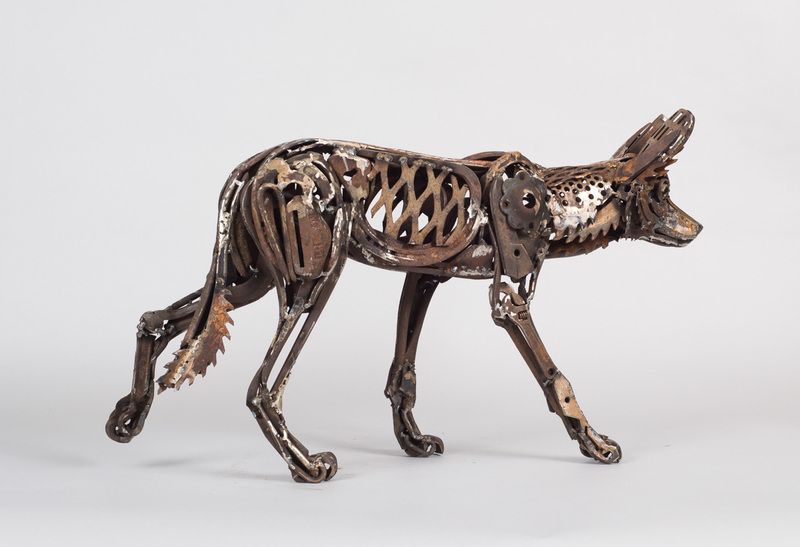 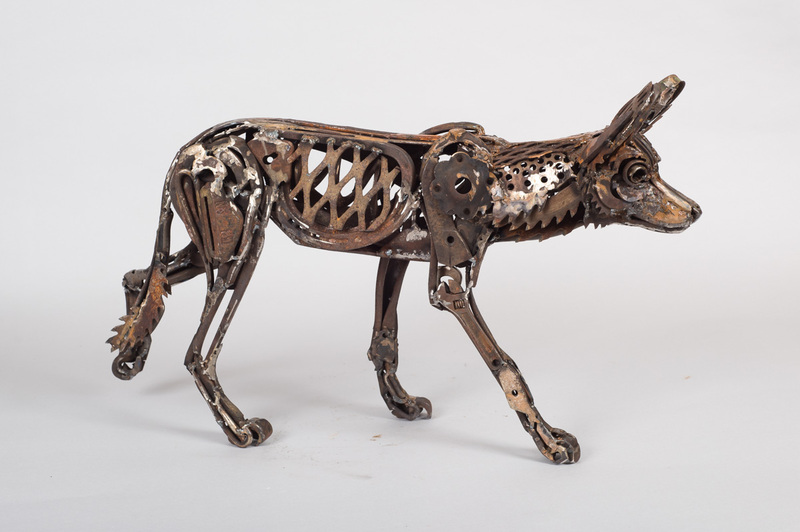 This sculpture has a slotted spoon for one ear and what appears to be a holder for an air filter from an engine of some sort for the other ear. 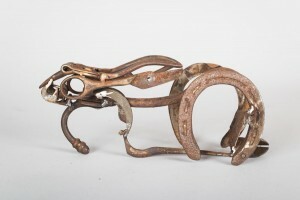 I am pleased with the balance of the piece and the hind foot off the floor. 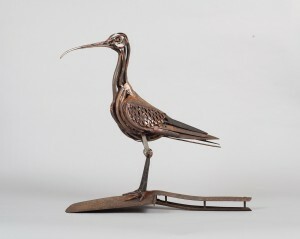 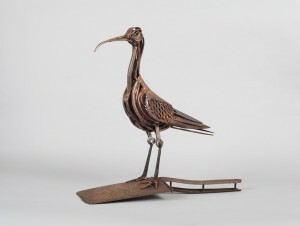 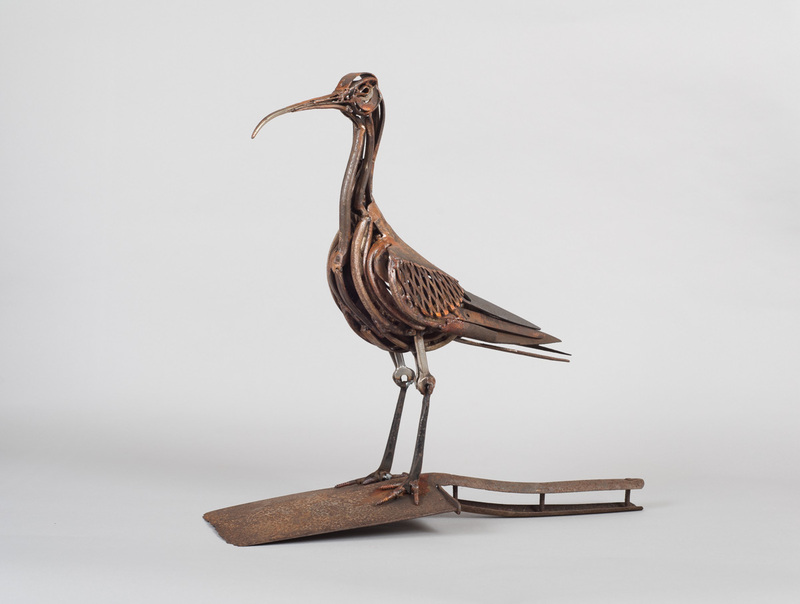 This Curlew sculpture was inspired by an unusual pair of curved forceps. 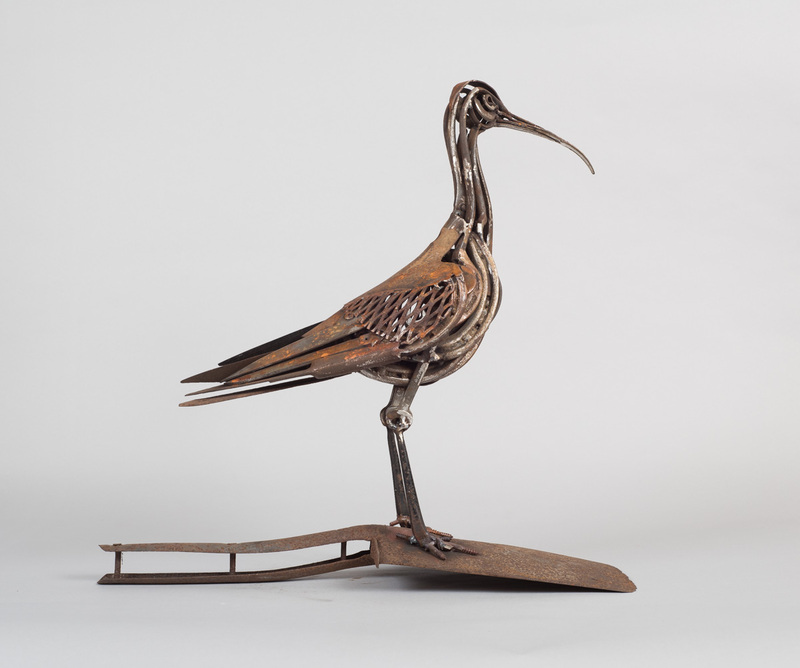 They could have been a little longer for my purposes but I chose to keep them as I found them and hope the curlew experts would forgive me. 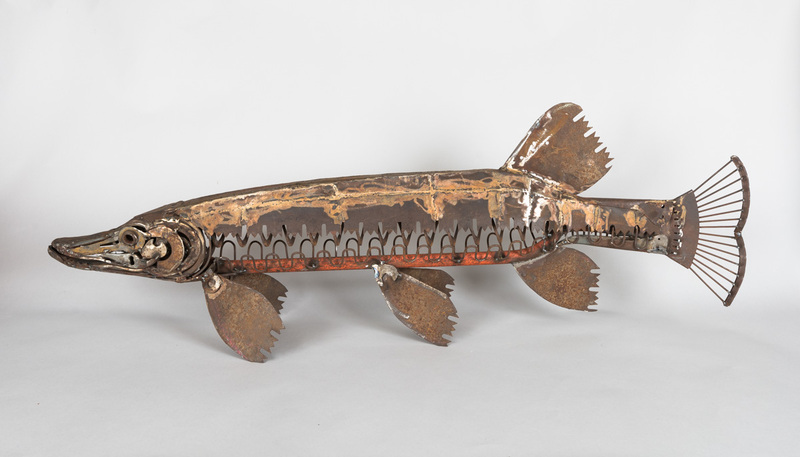 Leaf Rake Pike is a bit of a monster at around 4 feet long. 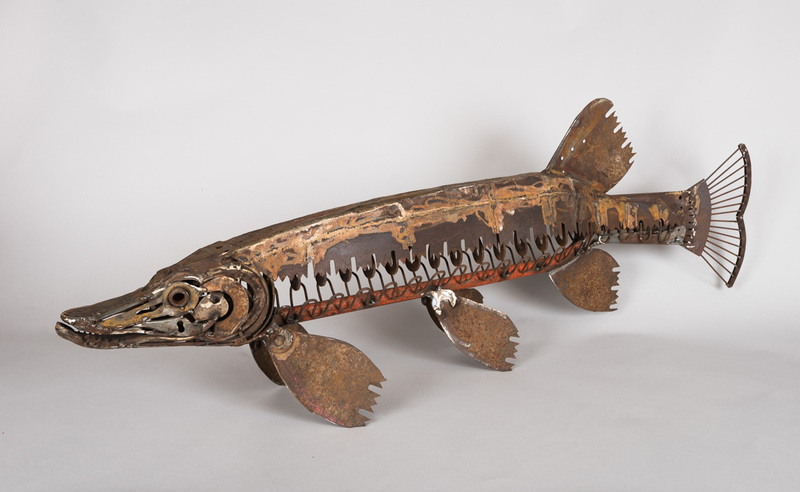 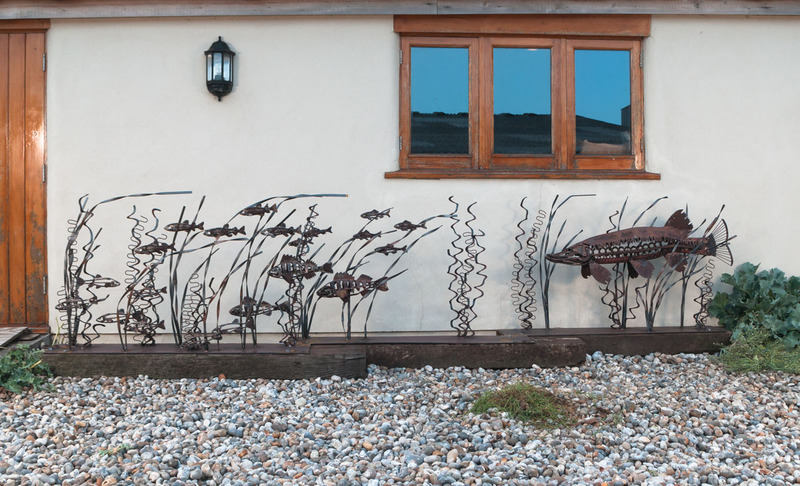 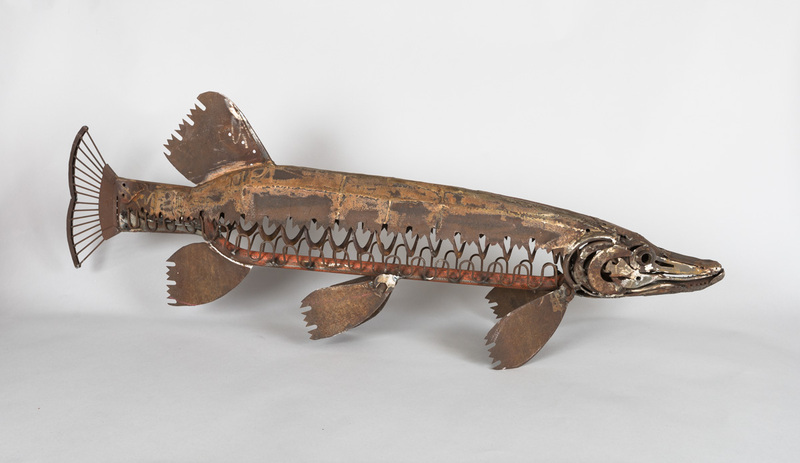 A few years ago I made a multiple fish sculpture which had a pike and more than twenty small fish in a river setting. I always loved the power of the pike in that piece so I decided to make a similar one as a stand alone work. 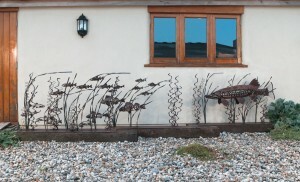 Here is Fishscape from a few years ago. 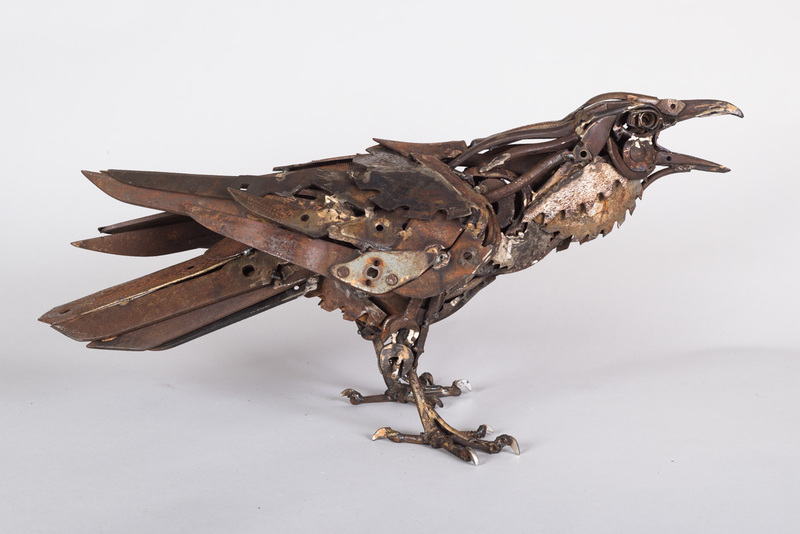 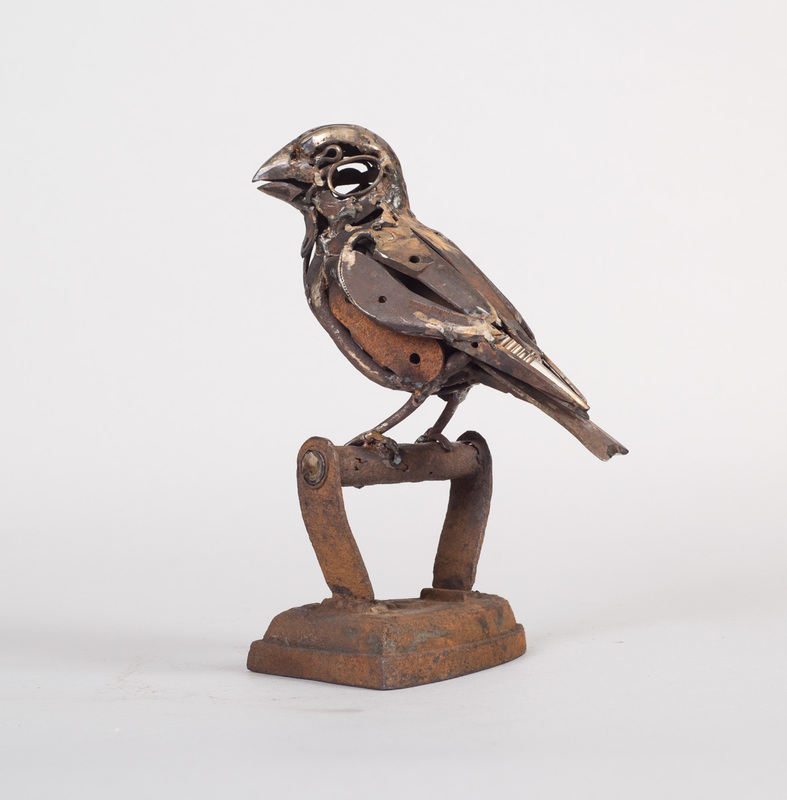 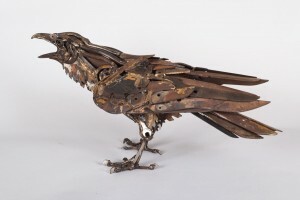 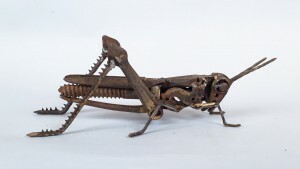 I also have Iron Hawfinch, Itchy Hare, Coat Hook Hare and Stair Rod Grasshopper on show at the exhibition. 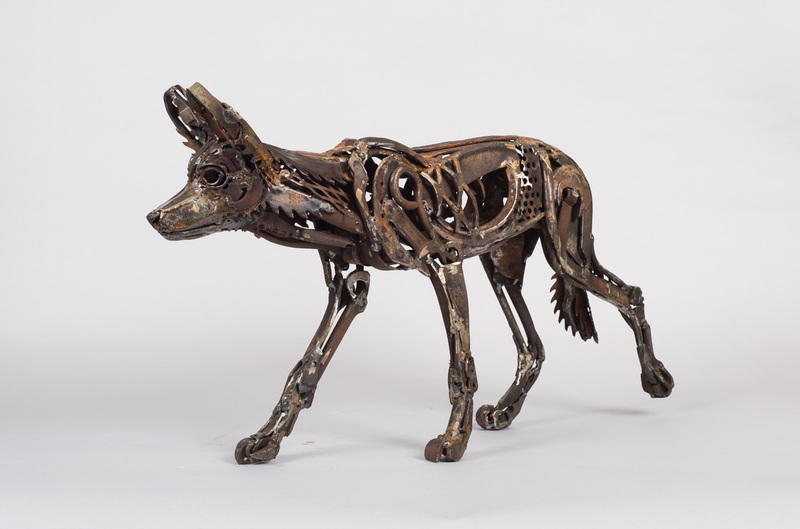 This entry was posted in Uncategorized on October 6, 2018 by harriet mead.